The power of the steel-coated riff, in all it's forged metallic, shake-your-body, fist-pumping, air-guitar glory. The power of great songwriting, numbers which at once energize, enthrall, engage and entertain. The power of great delivery, the platinum-plated quality of honest, hohned, aggressively-crafted pure heavy metal music. This is a Call To Arms… and this is the resurgent rallying cry that generations of denim & leather clad supporters have been waiting to hear. Packing an armoury of steel-coated riffs and songwriting swagger, British hard rock legends Saxon will release their 19th studio album titled Call To Arms in May 2011. Recorded at Chapel Studios in Lincolnshire, UK and Brighton Electric Studios in Brighton, UK, the 11-track album was co-produced by singer/songwriter Biff Byford and Toby Jepson (Little Angels). 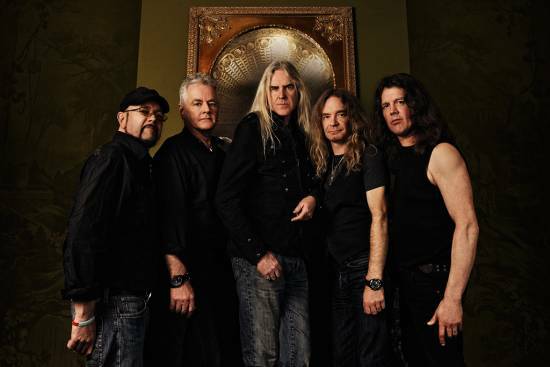 Featuring Byford on lead vocals, Paul Quinn and Doug Scarratt on guitars, Nibs Carter on bass and Nigel Glockler on drums, Call To Arms is bang on-the-money brilliant Saxon music, a confident embrace of the aura and writing values from their early years married perfectly to a modern Saxon crunch. Between the furious riffage of ‘Hammer Of The Gods’ all the way through to ‘Ballad Of The Working Man’, Saxon also found time to invite fans to sing on the nostalgic stomp of ‘Back In ‘79’ thanks to a Byford brainwave the night before recording. “We were at the American embassy in different lines queuing for our visas and by the time we’d got them, Don had agreed to come and play on the song,” chuckles Byford. It will also feature alongside the track ‘No Rest For The Wicked’ in the forthcoming movie ‘Hybrid Theory’, a sci-fi thriller which follows a group of British soldiers who find themselves in a life or death battle with an enemy far beyond their wildest nightmares. The film is directed by James Erskin who made ‘One Night In Turin’ about England at the World Cup in 1990).